Protecting your online privacy is important, and in order to do so, you just need to use a VPN. 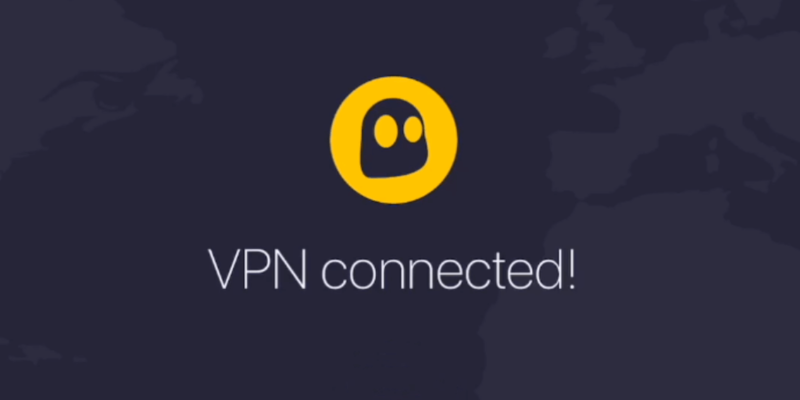 There are many great VPN services available, and today we want to show you the latest member of the CyberGhost VPN family. CyberGhost VPN is a famous VPN provider, and recently the company has released the latest version of their VPN tool CyberGhost 7 for Windows.Today we’re going to take an in-depth look and tell you what does the latest CyberGhost version has to offer. The latest version of CyberGhost for Windows is incredibly simple to use thanks to its friendly and straightforward interface. Once you install it, CyberGhost will sit comfortably in your systray so you can access it with just one click. If you don’t have a CyberGhost account, you can easily create it right from your desktop app in a matter of minutes. Once your account is ready, you just have to log in and you’ll be able to hide your IP address with just a single click. The user interface resembles the look of Windows 10 Settings app, so if you’re a Windows 10 user, you’ll feel like at home with CyberGhost 7. As you can see, connecting to an automatic server and hiding your IP address with CyberGhost VPN is incredibly simple, but you can also pick from one of 3000+ available servers. When you start the application, it’s automatically configured to pick the best location for you automatically. By doing so, you’ll be connected to the closest and the fastest server. However, you can assign favorite servers and connect to them with just two clicks. Of course, you can always expand the server list and view all available servers. Each location will show you relevant information such as the number of users, server distance and server load. If you want, you can add any of these locations quickly to your favorites list by clicking the star icon next to it. What’s more, you can expand each location and see additional information such as ping. To connect to a server, just double-click the desired server from the list and you’re good to go. 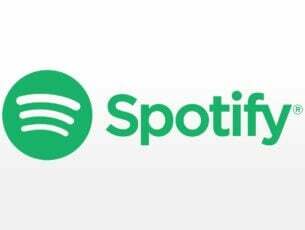 All servers are sorted in two categories, For torrenting and For streaming, so you can easily find the server for your needs. 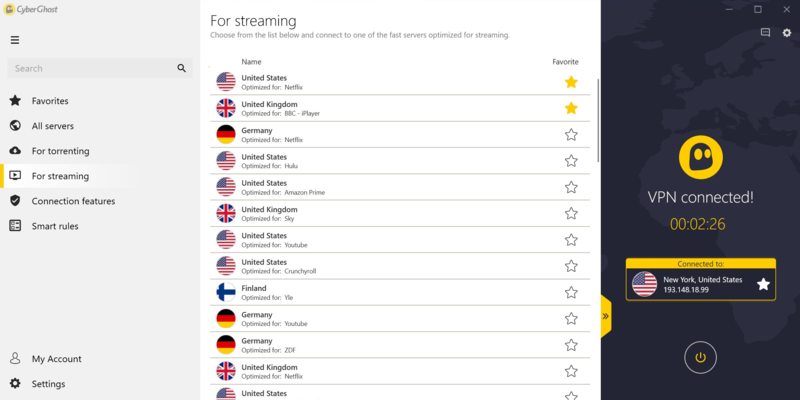 We have to mention that streaming servers will also tell you the name of the services that they are optimized for, which is perfect if you want to access geolocked content online. After you connect to a server, you can see your IP address and location, but you you also have access to a speed graph, as well as your current and maximum download speeds. You can also see the amount of downloaded Mb and the length of your session. 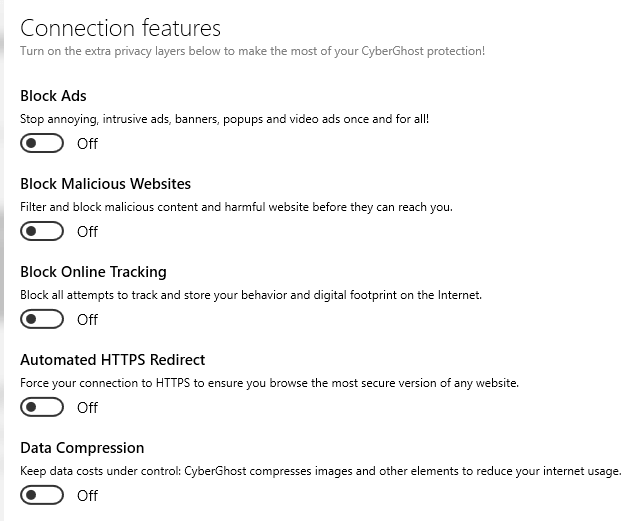 Cyberghost VPN supports some advanced connection features, such as the ability to block ads and intrusive popups. The VPN can also block malicious websites and online tracking which can be quite useful if you’re worried about your privacy and safety online. The application includes support for HTTPS Redirect feature to ensure that you’re always visiting the encrypted version of a website. Lastly, there’s a Data Compression feature that will compress images and other elements in order to make your browsing faster than before. All these features can be quite useful and you can enable or disable them as you wish. READ ALSO: What are the best VPN solutions that protect me against hackers? CyberGhost also supports various Smart Rules that you can use. Basically, these rules will allow you to automate certain tasks. For example, you can set Cyberghost to start automatically with your PC and connect to a specific server. You can even set a certain application to run as soon as the VPN establishes a connection. 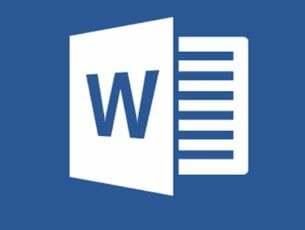 You can also establish certain triggers for both encrypted and open Wi-Fi networks in order to best protect your privacy. For example, you can set the VPN to automatically connect once you join a public Wi-Fi network, or set it to disconnect once you join your home Wi-Fi network. If you want, you can also configure certain websites not to use VPN. After covering some of the basic features, let’s briefly mention some other features that advanced users might appreciate. First of all, CyberGhost for Windows gives you unlimited bandwidth and traffic, thus allowing you to experience the highest possible speed. In addition, you can have simultaneous connections on up to 7 devices which makes Cyberghost perfect for your home. The application is available for all desktop and mobile platforms, so you won’t have any issues running it on your Mac, Windows, iOS, Android, Android TV, Amazon Fire Stick TV or Linux device. The application also has support for OpenVPN, L2TP-IPsec and PPTP protocols, DNS and IP Leak Protection. There’s also 256-bit AES Encryption ensuring that third-parties can’t read your data even if they intercept it. 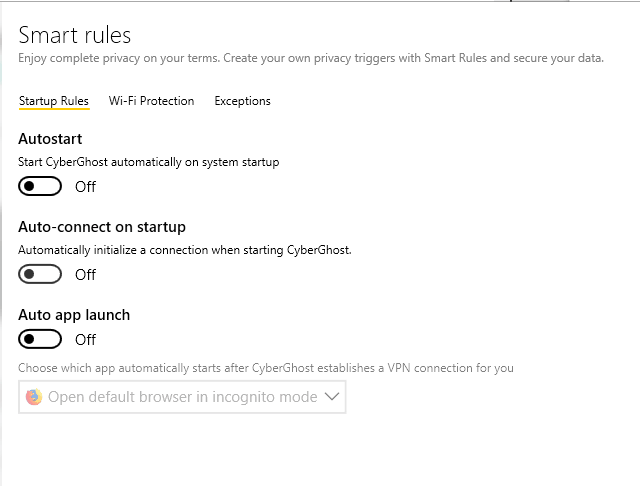 Lastly, CyberGhost has a string No Logs Policy, so even Cyberghost’s personnel can’t see your online activity once you connect to their servers. The latest version of Cyberghost offers some amazing features and simple to use user interface. Connecting to a server is simpler than ever, and even the most basic users will be able to use CyberGhost. The application is available for a 24-hour trial, but if you want to continue using it you’ll need to pick between 1-month, 6-month, and 18-month plan. Overall, CyberGhost 7 for Windows is perfect if you want to protect your privacy online or access services that aren’t available in your country, so if you’re looking for a new VPN, CyberGhost 7 is our top pick.